In the final recipe that I have for you all from the Walmart Challenge Chefs, I'm sharing Chef Chad Johnson's recipe for Grilled Sweet Pepper Rellanos with Goat Cheese, Charred Corn and Apricots! Preheat the grill using Kingsford charcoal, until briquets are consistently ashed over. Grill peppers over a medium fire until lightly charred on all sides. Place peppers in a bowl and wrap with plastic wrap, allowing to cool to room temperature. Char corn on the grill over high heat until moderately charred. Remove and cool and remove corn kernels from the cob. Mix the goat cheese, charred corn, apricots and basil. Season with sale and pepper. Cut a slit in the side of each pepper and gently scrap out the seeds. Fill each pepper with the goat cheese mixture until full. 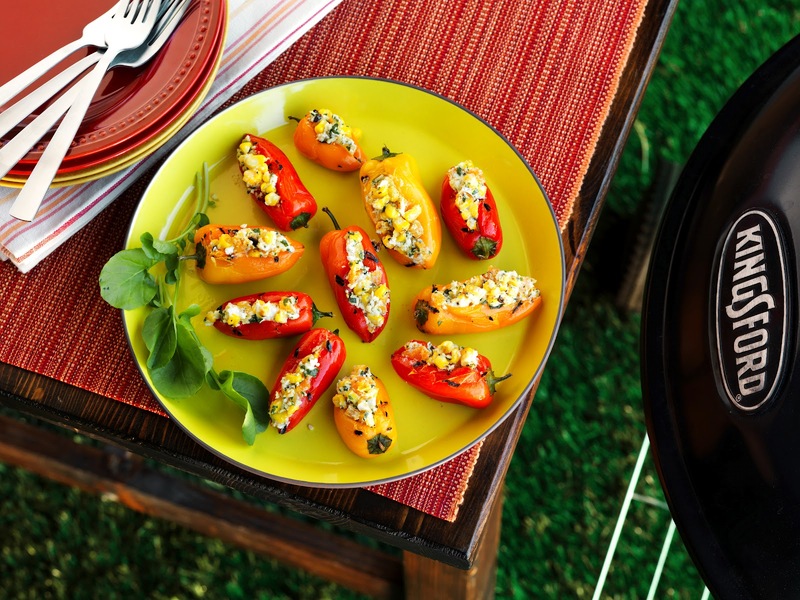 Return stuffed peppers to the grill and cook over medium heat until the goat cheese is warm and soft. Those sound wonderful! I'll be trying them soon!